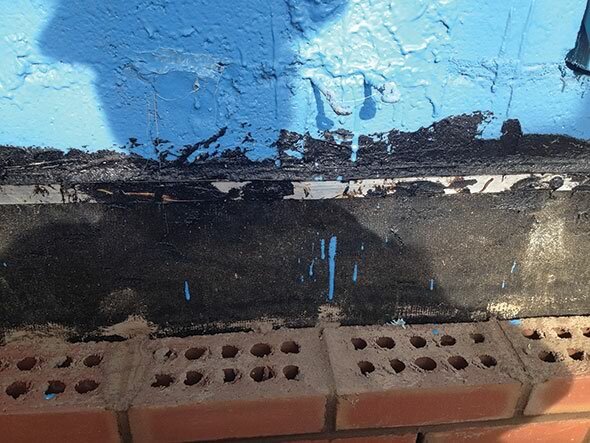 Flashings remain a critical component of any cavity wall system, diverting moisture outward as it collects in the cavity space to the exterior of the façade through the weep openings. A failure in this arrangement can ultimately lead to degradation of wall components, including mortar, lintels, non-stainless anchors, and fasteners, as well as a reduction of R-Value in certain types of insulation. In a steel stud wall system, flashings help prevent excessive moisture from reaching beyond the sheathing, causing mold growth and deterioration of the batt insulation and interior wall board. 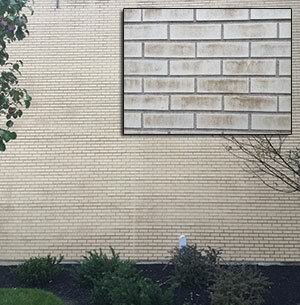 Since infiltration of moisture poses the greatest risk to the long-term integrity of a masonry wall, careful consideration must be given when selecting flashing materials to ensure continued performance through the life expectancy of the wall itself. Materials must be compatible. 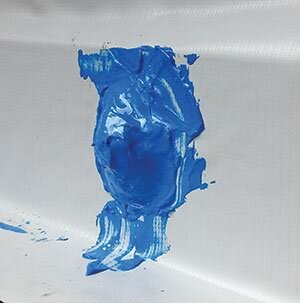 Shown here is an asphalt-coated flashing with a solvent-based mastic against a polymeric air barrier, which is not good. 6.1.5.1 Design and detail the backing system of exterior veneer to resist water penetration. Exterior sheathing shall be covered with a water-resistant membrane, unless the sheathing is water-resistant and the joints are sealed. 6.1.5.2 Design and detail flashing and weep holes in exterior veneer wall systems to resist water penetration into the building interior. Weep holes shall be at least 3/16 in. (4.8 mm) in diameter and spaced less than 33 in. (838 mm) on center. This provides the very minimum direction for the use of flashing and weeps as part of the overall building envelope, suggesting that if the sheathing is not water-resistant, the backup wall must be kept free of moisture. The flashings and weep holes assist in this assignment, though minimum weep size at maximum spacing allowed by this code section would be considered inadequate for drainage or ventilation needs of the wall cavity by most of the masonry industry. Exterior walls shall provide the building with a weather-resistant exterior wall envelope. The exterior wall envelope shall include flashing, as described in Section 1405.4. The exterior wall envelope shall be designed and constructed in such a manner as to prevent the accumulation of water within the wall assembly by providing a water-resistive barrier behind the exterior veneer, as described in Section 1404.2, and a means for draining water that enters the assembly to the exterior. Sealing lap joints is of high importance. Flashing shall be installed in such a manner so as to prevent moisture from entering the wall or to redirect it to the exterior. Flashing shall be installed at the perimeters of exterior door and window assemblies, penetrations and terminations of exterior wall assemblies, exterior wall intersections with roofs, chimneys, porches, decks, balconies and similar projections, and at built-in gutters and similar locations where moisture could enter the wall. Flashing with projecting flanges shall be installed on both sides and the ends of copings, under sills and continuously above projecting trim. While this code is still very broad, it does give us more of a directive. It provides some specific locations for flashing materials. It calls out for end dams. It also makes drainage a more imperative factor. Take the last part of 1403.2 for example: “ and a means for draining water that enters the assembly to the exterior.” This now requires a drainage plane and flashing system in exterior walls where it may not have been typical before. For instance, with lightweight manufactured or thin stone materials, it has been perfectly acceptable to apply metal lath to the exterior sheathing with nothing between them but a single layer of a common building wrap and to then adhere the stone directly. By this requirement of the IBC, if there is a possibility of moisture getting behind the veneer, we must provide for drainage, whether that is a double layer of building wrap or a full wall installed drainage plane. Flashings are present at the intersection of masonry and chimneys, walls, roof intersections, porches, decks, balconies, etc. Penetrating a flashing is not ideal, but sometimes you have to – like here at a relieving angle bolt. Assure any penetrations are completely sealed and that they only occur on vertical legs. 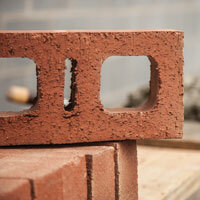 Another crucial component to the flashing system is the air or cavity space. This is addressed in another section in the Veneer chapter of the TMS 402-13 code that requires we maintain a minimum of a 1-inch air space. This void serves many purposes, including ventilation and drainage, which ultimately minimizes efflorescence. Many would argue, however, that a 1-inch air space is insufficient in a masonry wall, due to construction tolerances. Tolerances of plus or minus 1/4 inch are allowed for both the backup and veneer walls across 10 feet. Consider then, what a 1-inch air space becomes when the backup wall moves outward 1/4 inch and the veneer wall moves inward 1/4 inch. Fifty percent of the air space is lost, and mortar bridging from the veneer to the backup becomes a certainty. Most industry professionals recommend an air space of 2 inches, or at the very least 1 1/2 inches. This provides the mason with more room to work and less constriction of the cavity wall when moving in and out of allowable tolerances. Provided adequate weeps are installed at shorter intervals, a larger cavity also helps to equalize pressure levels to that of the exterior, keeping air pressure in the wall cavity lower. What the codes referenced above do not in any way address are items such as material durability, recommended installation methods of flashing materials, or the use of drip edges a the veneer face. For these general requirements or good practice topics, we look to technical papers written by an advising entity such as the Brick Industry Association or the International Masonry Institute, or of course to the various manufacturers – provided their track record is long in keeping with good masonry practices. Shown is a cell vent, fully opening head joint. While both of these statements are completely true, the one consideration that needs to be given above all else today is compatibility of material adjacencies. We can no longer simply look to the performance expectation of the flashing material, but have to consider everything it touches, and respectively everything that touches it. 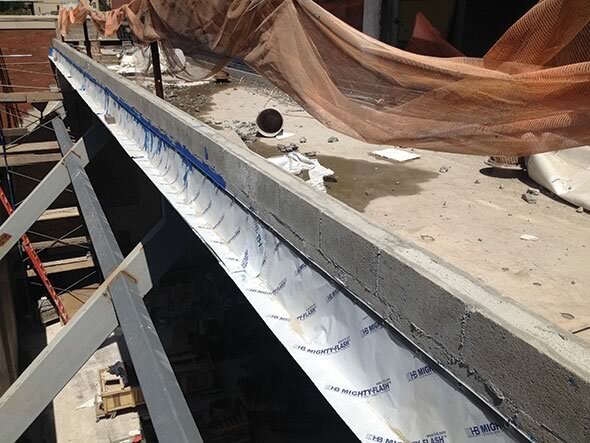 As an example, most air or air/vapor barriers today are polymeric in their composition. This typically requires the use of compatible sealants like silicones or urethanes. If we were to simply recommend the use of the same copper composite flashings we have used consistently over the last several decades, those sealants would not be able to adhere to the flashing material. 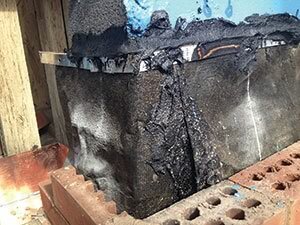 Conversely, the mastics used for lapping and sealing those asphalt-based flashings typically are petroleum-based and contain solvents, which likely will cause damage to the polymeric barrier material. The same consideration should be given to the self-adhering flashings that require solvent-based primers before installation. These concerns have brought about some changes to flashing materials over the last decade or so. In many cases, asphalt coated copper composite flashings have shed their asphaltic layers for a polypropylene film, which replaces the standard fiberglass scrims in helping to strengthen and support the copper foil. Polypropylene also allows for better adhesion to many types of sealants, and can be coated with special additives to allow for a stronger adhesive bond, or also for UV stabilization. In shedding the asphaltic component, this also eliminated a significant amount of weight from the flashing rolls, which meant they could be manufactured in longer lengths. Longer, lighter flashing rolls ultimately mean longer continuity of flashing runs without lap joints. Of course, fewer lap joints in the end mean fewer opportunities for flashing failures. The same manufacturing process has been applied to a lightweight, flexible stainless steel foil. The advantages of using stainless steel in a masonry wall are numerous. First, stainless steel is common to drip edge plates, termination bars, and fasteners that already are being used in the same proximity as the flashing material, so we eliminate the possibility of galvanic corrosion in the wall. Also, stainless steel is much more cost-stable than copper. Consider this: when a mason contractor calls for a cost on a large amount of copper flashing to bid a job, then four to six months later is actually awarded the subcontract, the price of a standard copper flashing can rise as much as 40 percent. Stainless steel in foil form hasn’t moved much more than 5 percent in the last few years. But more importantly, for a cost equal to or less than that of a copper composite flashing, a comparable flexible stainless steel flashing’s puncture resistance is 20-percent greater and its tensile strength is doubled. Shown is the beginning of vanadium staining due to a lack of ventilation in the wall. There were no vents at the wall top, and cotton ropes were used instead of open weeps at the bottom. Changes also have occurred in the way self-adhering flashings are manufactured. Until recently, most of these “peel and stick” membranes have been comprised of between 4mils and 8mils of extruded polyethylene and between 32mils and 36mils of a rubberized asphalt adhesive. This technology has been left relatively unchanged over the better part of the last 30 years, but it has not been without its setbacks. First, an extruded polyethylene film can best be envisioned as the same material we see in a common kitchen sandwich bag or the bags we take home from the grocery store. The problem is that polyethylene film by itself does not provide a surface that is easy to adhere to, or to allow for the adhesion of other materials. Additionally, polyethylene films do not allow for easy lamination to the rubberized asphalt component. When placed in an environment where we have extreme fluctuations of temperature and humidity, the course to delamination of these two components is easily set. Newer self-adhering flashings typically use much heavier membranes, up to a full 40mils in thickness, and they may use string-supported or woven films that add tremendous strength to the membrane. New manufacturing capabilities also make use of adhesives that have higher melt temperatures than rubberized asphalt, which prevents any adhesive leaching from the masonry joints when the wall is susceptible to heating beyond the rubberized asphalt’s melt temperature. These newer adhesives also retain better viscosity and elasticity than their asphaltic counterparts, which tend to harden, shrink, and crack, in the very same manner asphalt performs on a roadway. With the introduction of air/vapor barrier systems, there also has been a significant change in the way flashings are installed on a CMU backup wall. The term thru-wall flashing indicated the flashing material was laid into the mortar of the bed joint on top of the second course of block backup. This type of installation is no longer practical, as flashing installed prior to the air/vapor barrier materials likely will interfere with the continuity of the later applied barrier system. 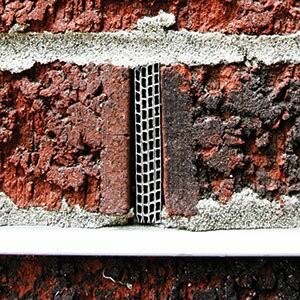 Instead, all flashings should be installed at the same time the brick is laid by attaching them to the backup wall with a termination bar. This also allows for the flashing to be left off the wall for extended periods before the brick installation where it is susceptible to weather and other damages common to the construction practice. Because there are so many products available to the design community today, and because the adjacent materials in the masonry wall are in a perpetual state of evolution, it is more important than ever to thoroughly vet our material selection and wall details, taking particular care in detailing the interfaces of adjoining systems or products. When soliciting information from the flashing manufacturer, be sure to compare testing data on critical elements like puncture resistance and tensile strength of materials. Most importantly, be sure to compare the period of warranty offered by the flashing manufacturer to the life expectancy of your wall, and you should have a pretty clear indication as to whether or not the material you’re considering is appropriate to use. Jeremy S. Douglas CSI, CCPR is director of architectural sales at Hohmann & Barnard, Inc. Although peak tornado season typically occurs April through June, violent outbursts struck early this year and featured one of the largest tornado events to ever occur in winter. The January 21–23 spate of storms produced 79 confirmed tornadoes across the Deep South from Texas to South Carolina, resulting in the second-deadliest January outbreak on record. According to the National Oceanic and Atmospheric Administration (NOAA), the U.S. averages more than 1,000 tornadoes per year — more than any other country. Annual insurance losses from U.S. tornadoes and thunderstorms range in the billions, with the costliest event occurring in Tuscaloosa, Ala., and nearby areas in April 2011, resulting in $7.8 billion in insured damages. Six constructed block warehouses at the Maryland Science Center in Baltimore are a testament to on-time and on-budget delivery. Built by St. John Properties, the buildings provided the center with a distinct advantage, both in the way they were constructed and the resources used – time, labor and materials. On Thursday, Aug. 14, 2014, the Masonry Advisory Council (MAC) will host a Continuing Education Breakfast in Oak Brook, Ill., where attendees can earn 2.5 AIA Credits. The event is sponsored by Brick Distributors of Illinois and the Illinois Concrete Products Association.